Roofing Contractor Leaves Job Half Done When He Finds Out What Evil Work Business Does! You just have to admire a business that puts principles first above profit. In Wichita, Kansas that is exactly what happened. An abortion clinic there needed a new roof. They couldn’t get any contractors to do the work because well… they’re baby butchers. So, what do you do when you can’t get a contractor to ignore that you do infanticide for a living? Why, you lie of course. They pretended to be a real estate firm and got a contractor to begin work. 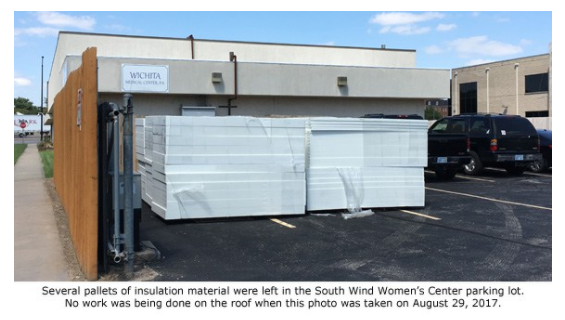 The roofing company got into the job, found out it was an abortion clinic and although they were out of pocket on materials and time, they packed up and walked off the job. Slow clap please. That’s a contractor I would hire in a heartbeat and pay extra for it. The roof was only half complete when they left and they didn’t look back once. No amount of money is worth helping a business that does evil work like that. 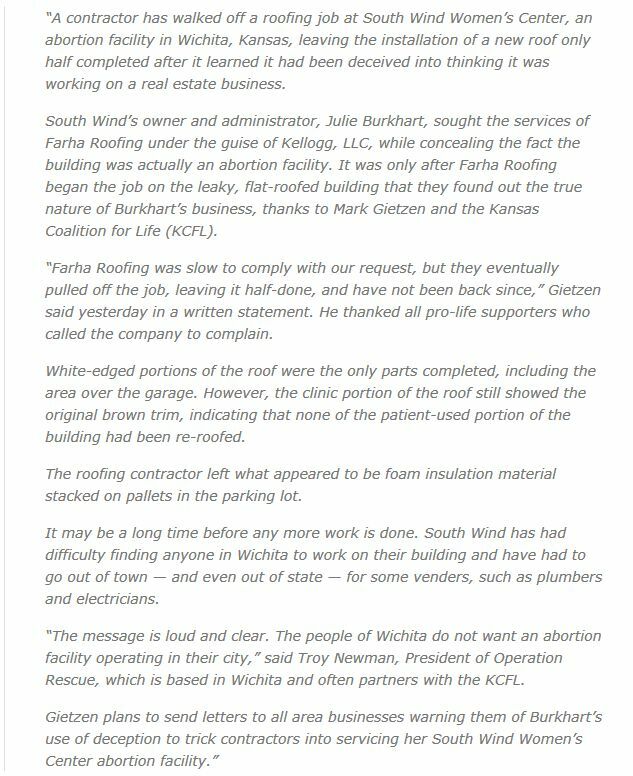 Farha Roofing found out about the true identity of the business thanks to Mark Gietzen and the Kansas Coalition For Life. 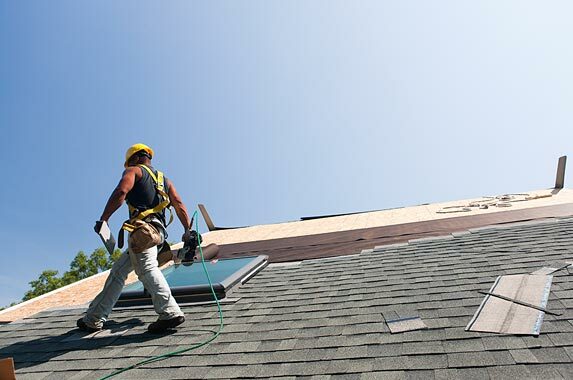 The roofing company was reluctant to pull out because of the expense, but after enough complaints via phone calls, they packed it in and called it a loss. Inexplicably, they left foam insulation on pallets there as they left. The abortion business has had to go out of town and out of state to get help from plumbers and electricians. It may be a very long time before that roof gets finished. Good. Gietzen plans to send letters to all the surrounding businesses to warn them that the abortion mill lies in order to retain contractors. It’s pretty obvious that Wichita does not take kindly to abortion clinics. And if you have to lie to get people to help you, you are in the wrong business. Abortionists murder over 900,000 babies a year. It’s genocide and it is deeply depraved and evil. Abortion is not simply another form of birth control. It is the knowing murder of another human being. They tear apart babies who are innocent souls and cannot protect themselves. Anyone who is against abortion should not have to take a job that helps them or promotes them, regardless of your religion. In my view, abortion is monstrous… it’s not only immoral and unethical, it is literally sacrificing babies on a bloody altar for profit. I applaud this roofing company for doing the right thing here and walking away. That building doesn’t need to be repaired… it should be demolished.